When you're parking system isn't working, it's costing you money. Choose a parking security system that you can count on - one that is durable and reliable. Automated Gates and Equipment offers you top-rated entry gates and leading brand, state-of-the-art control systems that last and last. Systems so well proven they are a frequent choice of security contractors and access control companies throughout the Northwest. 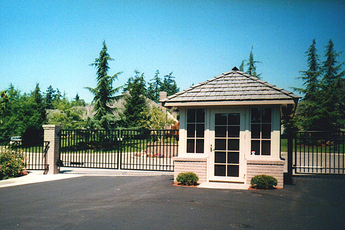 Along with quality products, Automated Gates offers the guarantee of 24-hour service, and convenient maintenance packages, so you'll never have to worry about repair problems. No matter how unusual your design or installation requirements, Automated Gates and Equipment can meet your needs. Forget the pre-fab or packaged solution; we custom build each parking system. And, with our in-house design and fabrication departments we can easily create and customize a design to fit your exact needs. Take a look at some of our parking systems below and you'll see why Automated Gates is the most sought after resource for commercial security gate needs in the Northwest.